The countryside between Plettenberg Bay and Port Elizabeth is very hilly and has many rivers flowing through it to the sea. The rivers have cut deep and wide gorges into the land and spectacular mountain passes had to be built to allow vehicles to cross them over low level bridges. Negotiating these passes took time and with constant rockfalls and continual maintenance of the roads in the mountains it was decided to modernise the roads through the Tsitsikamma area and build bridges over the gorges encountered on the route to be followed. 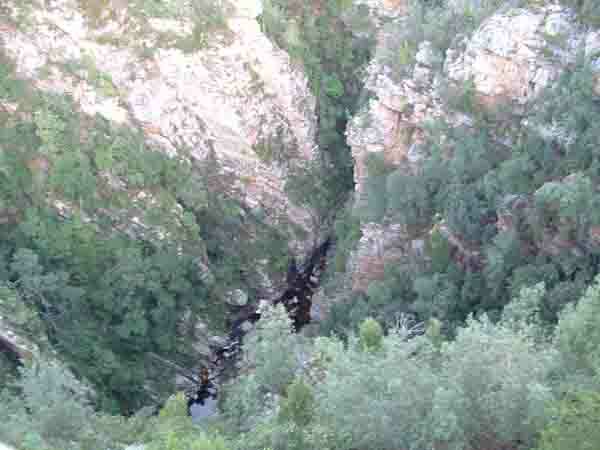 One of the rivers that had to be crossed was the Storms River. The building of the new Paul Sauer Bridge over the Storms River began in 1954. It began with the building of two platforms one on either side of the gorge about two hundred feet down the side of the cliff faces. They were built to anchor the arch that was to be constructed in two sections, one on either side of the river. The halves were constructed on the platforms with each section standing erect and held by cables during the construction phase. Once the sections were completed they were lowered by cable across the gorge until the ends met in the midair about three hundred and fifty feet above the level of the river. Engineers had to be spot on with their planning and measurements to get the two sections to meet. Once each section was in place over the river they were joined to complete the arch. The base of the bridge was now complete and legs to support the roadway were built on top of the arch . When all the supports were in place the roadway was constructed on top of them. The bridge was finally completed in 1956. 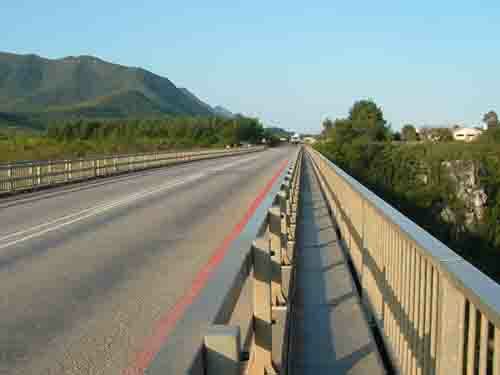 The Storms River bridge is 630 feet long and the road is 405 feet above the water. The arch supporting the bridge has a span of 330 feet. Once the bridge had been completed many people stopped to view the bridge and to look at the river far below. View points and pathways near and under the bridge were built to give access to the spectacular views of the bridge and the gorge it crosses. Over the years the bridge has become an important tourist attraction and a whole village has grown up on the western bank of the river close to the bridge. Travellers can stop and have a meal at a restaurant that overlooks the bridge and the gorge. It is a pleasant place to have a break on the two hour drive from Port Elizabeth to Plettenberg bay. Next time you travel the N2 stop at the Paul Sauer bridge over the Storms river and look down into the gorge and marvel at the technology it took to build this spectacular bridge especially way back in 1954. It's worth the effort. 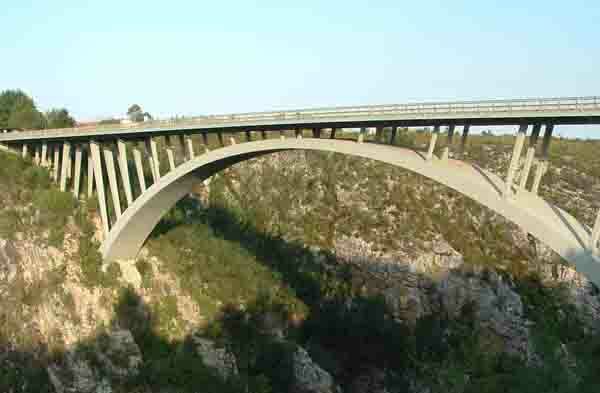 With the completion of the modern bridge the old Storms River pass to fell into disuse. These days it is negotiated in 4 X 4 vehicles which take visitors down its winding roads to the river to show them some of the spectacular scenery in the area. To keep this old pass for future generations it appears that authorities are shortly going to declare it a natural heritage site.